On Wednesday, October 10, Joe Giudice, Bravo reality star from the Real Housewives of New Jersey, was ordered deported by an Immigration Judge in Pennsylvania pending the upcoming completion of his 41-month prison sentence. In particular, he had pled guilty to multiple counts of wire fraud, bankruptcy fraud, mail fraud, and tax evasion, for which he was charged as an immigration aggravated felon. Giudice is set to be released from prison in March of 2019 and will then be transferred to ICE custody for deportation back to his home country of Italy. 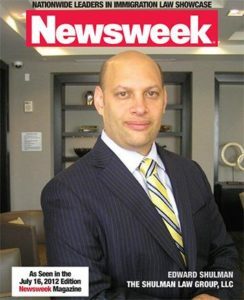 Immigration attorney Edward Shulman, founder and principal of the Shulman Law Group, LLC, was approached by several media outlets including E! News and US Magazine to provide exclusive interviews and an expert legal opinion about the immigration facets of the Giudice case. Specifically, Shulman was asked about the consequences of the immigration judge’s ruling, the deportation process, the prospects of a successful appeal, and potential familial consequences.